We've had the pleasure of trekking extensively around the Middle East - it's a favourite nook of ours because it has blazing sun, friendly folk and of course, APF eats! When you think of the Middle East, a greasy meaty shawarma or yoghurt topped delicacy springs to mind, but actually, as is often the case in hot countries, there are many APF dishes - because historically in that sunny climate, storage was an issue and dairy products often curdled quickly. All we know is we were travelling long hours, sightseeing and sweating and we needed APF assistance. 1. Falafel. Falafel, Falafel. You know what they say: 'Once you have them in Beirut, you'll never go back.' Or at least they should say that! Freshly-made. Clean-tasting. Crisp. Delicious. There's a falafel stand on every corner and don't worry about them being deep fried in dirty oil either. Obviously use your judgement, but we found the majority of stands to be vegetarian. 2. Hummus. And more hummus. In vats. Often. Last year the UK got through £60m of the chickpea blend (that's 12,000 tonnes of the stuff!) and yes, you can get pink ones, yellow ones, brown ones, ones with sprinkles, ones with chunks...but let me tell you, hummus served under the hot sun, mopped up with a massive chunk of warm pitta fresh from the oven beats a £1 mini pot from your local supermarket. 3. Tabbouleh - a refreshing salad of bulgur, chopped parsley, tomatoes, mint, onions, lemon juice. After all the pitta you've been hoovering up, this is a welcome, light, fresh meal. Often served with a drizzle of tahini (sesame seed paste) on the top. Two amazing tastes in one dish. 4. Halva - a sweet that hits the spot completely. And you only need a little to hit that spot! It's a crumbly fudge-like candy made from sesame paste and comes in a number of variations, most commonly pistachio flavoured. *Be sure to check store bought cheaper versions do not contain eggs and dairy. 5. 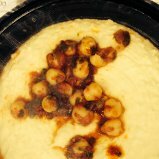 Ful medames - stewed, mushy goodness of fava beans, with olive oil and a sprinkling of red pepper. Often served warm, as a breakfast dish. And don't worry! The creamy stuff drizzled on top isn't yoghurt, it's tahini, so dig in! If you end up in Israel, you'll be one of an estimated 200,000 vegans (out of a population of about 8 million). Definitely leading the way for the Middle East in the APF revolution, particularly in Tel Aviv, where Dominos Pizza and the popular coffee chain 'Aroma' have been successfully petitioned to provide vegan options. You'll also be glad to know that Jewish dietary laws (kashrut) are very specific and complement our APF beliefs. Kashrut forbids consumption of pork, shellfish, insects or food that has been infested by insects, and meat and milk is never served together or cooked with the same utensils. So searching for the 'Kosher' sticker is a good place to start. What's great is that food in Israel is labelled thoroughly (Containing Dairy (D), Manufactured on Dairy Equipment (DE) etc. ), but keep your eyes peeled because fish and eggs are considered 'pareve' (acceptable to consume). When we crossed over into Palestine we learnt the all important statement in Arabic: 'ana nabati', roughly translated as I am vegetarian but understood also to mean 'I am vegan', and 'biddun lahme' meaning 'without meat'.